John Riddell here begins bringing to a close an epic project of over ten years duration – the publication in English of the entire proceedings of the Third International, or Comintern, in Lenin’s time. 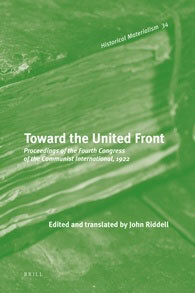 The very expansion of the Comintern itself is reflected in the increasing scale of each volume in this series. The minutes of the First Congress edited and published by Riddell in 1987 slipped into a single book; the proceedings of the second congress already took two volumes, and the proceedings printed here of the fourth congress occupy a mammoth single hardback volume of over a thousand pages. This growing escalation reflected both the expanding membership of the Comintern itself, and the rapidly expanding scale of the issues it discussed, with the Second Congress of 1920 being marked by the input of Asian as well as European revolutionaries for the first time, and a full consideration of the colonial question. The full proceedings of the Third Congress, which occupied a critical transitional period in 1921 between continued Bolshevik hopes for a world revolution, still a theme of the Second Congress in 1920, and the acceptance of capitalist stabilization after Versailles broadly embedded in the present volume, still await full editing by Riddell, but the publication of these is promised imminently. The closure of this epic publication effort will also mark the end what was in many ways the height of the Comintern’s international activity in an annual congress format; the next Comintern Congress, the Fifth, followed only in 1924, and the Sixth Congress in 1928. The occurrence of more irregular congresses (the seventh, and last, came in 1935) reflected both the declining role of world revolution in Soviet foreign policy, and the increasing Stalinization of the Comintern itself. Riddell has here pulled off an immense and masterful editorial effort, comparing past publications of these proceedings in the four main languages of the Comintern – English, French, German and Russian. As he notes in his introduction, whilst there are few major discrepancies between various versions of the proceedings, translations in one language often clarify meanings which are lost in other languages. The process of comparing past publications of the full proceedings has in the case of this edition also involved consulting a Serbo-Croation text from 1981 (57-8). The work involved in clarifying the differences between texts, providing more accurate annotation, and correcting the misspelling of names and providing relevant biographical details is immense, and should earn the gratitude of generations of scholars for many years to come. The work of the Fourth Congress embraced a number of key themes of critical interest to anyone attempting to study the history of the Comintern. For the sake of brevity I shall try to summarize only a few of the main ones here. The Congress featured the last appearance of Lenin at any meeting of the Comintern. Compared to his previous addresses, Lenin’s input at this congress was extremely limited, and his general posture and level of analysis that of a man who was already gravely sick. The Second Congress of 1920 had marked the birth of Lenin’s advocacy of what later became termed a united front policy, via his advocacy in his famous pamphlet Left-Wing Communism that European Communist party members participate in bourgeois parliaments and form pragmatic alliances with Trade Union leaders. Lenin’s input at the Fourth Congress, the first to have to consider the rise of fascism in a European context, lacked any comparable strategic direction. His warning that the resolution of the Third Congress on the organisational structure of the Communist Parties was too much based on Russian experience (303-4) has been interpreted by some as an advocacy of greater plurality and tolerance within the Communist movement. However the actual wording of Lenin’s statement remains ambiguous; whilst advocating that all Communists must now in practice sit down and study ‘from scratch’, in practice he also stated bluntly that the ‘first task’ to be addressed is that the ‘foreign comrades’ do not in fact understand the resolution, not that the resolution itself was wrong. The danger as Lenin saw it was that foreign parties ended up merely ‘hanging [the resolution] in a corner like an icon and praying to it. Nothing will be achieved that way. They must assimilate part of the Russian experience.’ (305) Given therefore both his ongoing firm advocacy of the relevance and leading role of Russian experience but also the need for better translation and understanding, both Stalinists and anti-Stalinists were scarcely hindered from interpreting what was in practice going to be Lenin’s final advice to the international communist movement in ways that served their own particular interests. The congress was also notable for its discussions and resolution on a united front policy. The final resolution of the congress, ‘On the Tactics of the Comintern’, fully endorsed Communist parties, with permission of the Comintern, entering into alliance with non-Communist workers’ parties and workers’ organisations. The theology around determining the precise class character of a given government or movement however left in practice much ground open to dispute and reinterpretation; the extremely qualified and conditional endorsement of broad alliances sowed the seeds of political sectarianism amongst the left almost everywhere. The resolution itself was fiercely debated and discussed; the amendments made to the definition of a workers’ government underlined the ongoing difficulty of creating a typology of acceptable coalitions. Polish delegates openly opposed the united front policy on the basis of their own experiences of attempting to put it into action (238); the Italian delegation led by Bordiga, the group perhaps most familiar with the rise of fascism and its appeal to the working class, were equally critical about the united front tactic in particular, and far more pessimistic about the possibility of attaining power by that route in general. Finally, the proceedings of the congress underline in general the challenge of operationalizing what was intended to become a world communist party. Bukharin noted the divisions within the French delegation (206) and condemned the actions of the French Communists as terribly passive and disorganised. His speech throughout, scolding many of the European parties, was noted for its resort to humour, provoking what appear to be genuine and frequent gales of laughter. Reading Bukharin’s rather witty analysis makes Stalin’s later resolve to utterly exterminate Bukharin himself all the more poignant in retrospect. However Bukharin endeavoured to underline a serious point in his speech – namely, the inability of the assembled delegates to conduct a genuinely strategic, international analysis, and their tendency to revert to discussing the situation in their own countries instead. This remains a challenge not without its lessons to the left today. This magnificent volume offers one very fruitful route to consider again the correct strategy for the left to take in today’s own era of crisis and potential transition.